CD Review: Billy Squier, "Don't Say No: 30th Anniversary Edition"
30 years. Jesus. Really? I was in Chicago earlier this summer and had a brief visit with my longtime frenemy and Popdose colleague Robert Cass. During conversation, I was expressing to Cass how many of the Flashback posts for this year are hitting home, as all of my favorite albums from 1990 turn 20. And then, I got the 30th anniversary edition of Don’t Say No by Billy Squier in the mail. To be fair, they’re blowing out the candles a little bit early, since the album was originally released on April 13th, 1981. 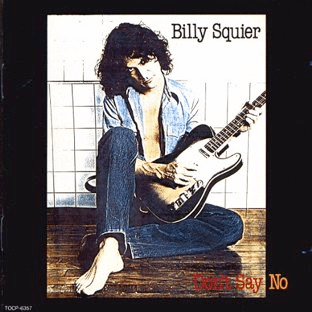 By the time Don’t Say No was released, William Haislip “Billy” Squier (yeah buddy, that’s his own hair….oops, wrong band) was already three albums into his professional recording career. The first two albums came in the mid ’70s under the band name of Piper, including their self-titled debut, which Circus Magazine labeled as the greatest debut album ever produced by an American rock band (we’ll let the judges think about and weigh in on that one). As the chief songwriter, lead guitar player and lead vocalist of the group, Squier eventually realized that there was no need to share the limelight with others under a band name, and struck out on his own. Tale of the Tape was Squier’s solo debut, and although there were no charting singles from the album, Billy hadn’t even begun to get started. As Bottom Feeder guru Dave Steed will tell you, Squier had 11 charting hits during the ’80s, and a big chunk of those can be found on Don’t Say No. Squier wanted Queen guitarist Brian May to produce Don’t Say No, but schedule conflicts made it impossible for May to take on the job. No worries though, because May had a good backup plan in place – Queen producer Reinhold Mack, who had produced The Game for the band. As a Queen fan, I would have been very interested to hear how Brian May would have changed/shaped the sound of Squier, but looking at the track listing for Don’t Say No, I guess Squier and Mack did okay in the absence of May. And by okay, I mean that they managed to lodge three serious ’80s rock hits (and a total of four hits on the album with “Lonely Is The Night” falling later in the disc) in the first three tracks of the album with “In The Dark,” “The Stroke” and “My Kinda Lover,” which might be one of the top five greatest songs of the ’80s. I jest slightly, but even today, that tune still jams. And that’s what Squier had a knack for, writing catchy pop/rock jams that had memorable guitar or synth lines, hooky choruses – you know, the essential elements that made for solid gold hits in the ’80s. I’d place him a notch or three below Sammy Hagar in both the songwriting and vocals department, but that’s not the only connection I’ll make between Hagar and Squier. As the ’80s progressed, Sammy’s star rose, while Billy’s star plummeted due to an unfortunate wardrobe choice in the video for “Rock Me Tonite” in 1984. Now, pop quiz: you tell me, what’s wrong with that picture? 30 years on, Don’t Say No holds up well while listening to this anniversary edition from Shout Factory!, which has new liner notes courtesy of longtime Squier associate (and former Creem editor) Ben Edmonds. Beyond the liners, the bonus features are sadly limited to a pair of live bonus cuts, recorded in 2009 from the board (and they’re not kidding, these are definitely raw board recordings). The live versions of “My Kinda Lover” and “The Stroke” are interesting (if you’ve been curious to hear how an almost-60 year old Billy Squier would sound tackling those songs now), but it’s a bit surprising that they didn’t opt to include live recordings from the album time period instead. In the end, the necessity of this release is probably debatable – the packaging and liner notes are great, but if you’ve already got this album, there’s probably not a lot for you here.